The American Family Association is calling for a boycott of Target after the retail giant said it would allow men to use the women’s restrooms and dressing rooms in their stores, if they say they are a woman by “gender identity”. The pro-family organization Citizens for Community Values is also urging people to avoid Target stores. This means a man can simply enter the women’s restroom, even if young girls or women are already in there, and if anyone questions him, just say that his “gender identity” is female. Many conservatives are shocked and dismayed, feeling that Target is ignoring safety concerns so that Target can be “politically correct.” Note that the big concern is not risk posed by the very small minority of “transgender” people, but that Target’s policy provides an open invitation to sexual predators to pretend that they should use the women’s restrooms. Many feel that only a boycott by customers, and letting Target know of their boycott, can cause Target to change its new controversial bathroom policy. 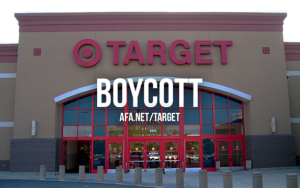 Those who would like the policy to be changed are urged to sign the Boycott Target Pledge at the American Family Association, and encourage others to do the same. If you are on Twitter, you may also wish to check out #BoycottTarget.